SHEVA, the name, was inspired by the Queen Sheba of Ethiopia who was believed to be a woman of power who accomplished whatever she set her mind to. With that in mind, SHEVA was born as a social enterprise to inspire women and girls to reach for the stars. We believe that girls are the most powerful force of change on the planet, if they are given the right tools and opportunities. 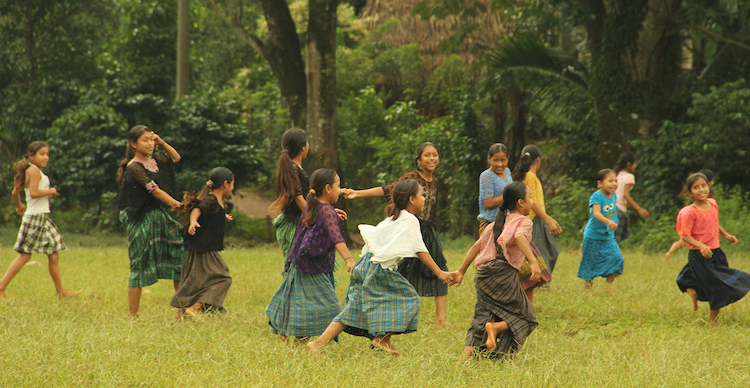 Currently in Guatemala, indigenous adolescent girls are the most vulnerable group in the country. The reasons include approximately 30 percent dropping out of school by 10 years old (and that’s just the ones who go to school), 41 percent are married before they turn 18, and 54 percent give birth before they turn 20. Numbers can’t lie, but we don’t see a problem, we see an opportunity. An opportunity to educate girls to become agents of change in their communities. Because girls drop out of school around the age they first start menstruating, sanitary pads is the tool we decided was key to their attendance. And now, to further our efforts, we are starting to implement a two-year educational program with local NGOs. The program touches on self esteem, finances, hygiene, life planning, and sexual and reproductive health. It’s been proven that if you educate a girl, she’ll one day get a job and earn an income. She’ll invest it in her family in things like food, medicine and education, thus raising a healthier family. Her family will inspire other families in her community, her community will set an example for other communities, and so on. It’s the ripple effect that everyone’s talking about, now commonly known as the Girl Effect. Thanks to this powerful movement, several brands (local and international) have approached us to create a “SHEVA” branded product for them to sell, giving a percentage of sales to our mission. Just last year, a jewelry store in Guatemala created a “SHEVA” bracelet and last week announced the new design of the bracelet. Both bracelets are still in production and providing monthly funds for our mission. Furthermore, companies are joining by adding into their corporate social responsibility (CSR) a project with SHEVA to empower girls with education. The reason behind this comes from the fact that companies are choosing how to invest in their CSR and because they trust SHEVA to do a great job, they are outsourcing it to us. As a result of the online store, many more ideas like the ones mentioned before are in the works. We are looking to new opportunities and projects that will help us grow exponentially to increase and speed up the help we give girls. It has come to our attention that this hasn’t been only about helping girls in rural Guatemala succeed. It’s been about our own learning experience, about the taboos that live and jump from mouth to mouth between our peers. It’s been about showing the world – women and girls, boys and men, of all ages – that they all have a voice, a voice that needs to be heard, a voice that has the power to say no, and the power to say yes, please. A voice with the power of change. We, at SHEVA, believe girls are the most powerful force of change in the planet. And that’s why it’s our purpose to provide the right tools and opportunities for them to change the narrative of the future. We are on a mission to empower 1 million girls by 2025. Katia Cerwin is the creative director at SHEVA in charge of all things that appeal to the five senses.